Made by Wilson, Roland in Canberra, Australian Capital Territory, Australia, 1938. This is a three-wheeled, convertible, battery-operated electric car which weighs about 10 cwt. The body is made of wood, sheet steel and Masonite on a derelict "Baby" Austin Seven automobile chassis and its parts. The rear of the chassis was altered to accommodate the single rear wheel. The wheels comprise Austin hubs welded onto fork lift rims. The rear axle was turned out from an old Model T Ford. The front wheel taper bearings were from a Vauxhall. The car has an open Masonite body with large wooden quad sections for corners which were all glued and screwed together and a bronze gauze imitation radiator. The boot, or tail, is fitted with top-mounted hinges with a stay for access to the electric motor and motorcycle chain drive assembly. The car is powered by a ball-bearing series 1.2 hp, 60 volt, 1200 rpm, DC electric Orwell Motor, type M25/51 made by Ransomes, Sims & Jefferies Ltd, Ipswich, Suffolk, England. This drove the single rear wheel via the chain. Ten, car-type, 6-volt lead acid batteries were located in the engine bay which powered the vehicle and provided a running time of 20 minutes. This was later upgraded to twelve 12-volt batteries. The bonnet can be unclipped and hinged forwards to allow access to the batteries. There was no provision to charge the batteries from a central point. Each had to be charged individually. The accelerator is a three-position switch. Pressing it down brought in the first relay which gave one third of the available battery power. By moving the pedal to the left and pressing down brought in the second relay and again to the left and down activated the third relay and full power. The car features two front headlights, a tail light, and an ignition switch on the steering wheel. Advance and retard switches on the steering wheel were used as head and side light switches. A hand-operated windscreen wiper is fitted while an inoperable speedometer was mounted on the dashboard for effect. It was never fitted with a speedometer cable and is no longer extant in the car. The car is now finished in red with blue upholstery. There are no doors and it has a single bench seat. There are transfers of the QANTAS flying kangaroo logo on both sides of the bonnet and the name "QANTAS" on both sides of the body. transfer at front sides "[logo] - the flying kangaroo"
transfer at center back "[logo] / QANTAS"
painted onto dash "DO NOT DRIVE CONTINUOUSLY IN / EXCESS OF 20 MINUTES"
The hubcaps feature the word "Austin". The tyres feature the wording: "Dunlop 4.00-8/RL.S Made in Australia". Roland Wilson built this car at his Canberra home as a small, light, electric commuter vehicle in which to travel to work. The chassis was adapted from a "Baby" Austin Seven. The main chassis members were cut half-way through, bent inwards and welded to provide for a single driving wheel at the rear. The front axles, stub-axles and wheel bearings, springs and dampers, steering gear, brakes, lamps, horns and wind-screen wiper were all from the Austin Seven. The front wheels were from an industrial truck, modified by brazing-in part of the original Austin wheel hubs. The back axle was turned out of an old Model T Ford rear axle. The brake drum and shoes were from the Austin and the assembly was mounted on an aluminium alloy carrier plate cast in Sir Roland's own back-yard foundry from parts of the crankcase of his father's 1918 Buick car. The bearings were from a Vauxhall front wheel taper bearings. The bearing housings and hub were machined from 2-inch (5 cm) steel pipe fittings and incorporated provision for adjusting the taper bearings and felt seals. Sir Roland was said to have been a small man and made the car to his own measurements. Any driver over 5 foot 3 inches (1.6 m) in height found it uncomfortable behind the wheel. The car was originally finished in light blue and designed to accommodate ten, 13-plate batteries made especially for Wilson by G. H. Gardiner & Co., 48-40 Renwick Street, Redfern, an inner suburb of Sydney. The electric motor was rescued from an old crane in Hobart built in the early 20th century. All the switch gear, control units, reversing switch and resistance unit were made by Sir Roland at home from scrap. Copper bolts made from flattened-out surplus ends of copper pipe picked up in junk shops and old curtain rods formed the radiator grille and reversing switch handle. Sir Roland was born at Ulverstone, Tasmania, in 1904, the son of a builder. He studied economics at the University of Tasmania, became a Rhodes Scholar and went on to receive a D.Phil at Oxford University in 1925 in economics and political science. After lecturing at the University of Tasmania, he gained a PhD at the University of Chicago in his late twenties and by the age of 32 was the Commonwealth Statistician. At 36 he was the head of the Commonwealth Department of Labour and National Service which he established in 1943 and the Secretary of the Treasury at the age of 47. Sir Roland apparently had no formal engineering or technical training but was an inventor, cabinet maker, metal worker and was interested in engineering and electricity. His electric car took about 12 months to build and was finished in 1943. Sir Roland was knighted in 1955 and between 1966 and 1972 was the chairman of QANTAS. He died in 1996. This small electric car was built and used by Sir Roland Wilson as a commuter car to travel between his home and office in Canberra from 1944 and 1947. In October 1944 it was displayed at a hobby exhibition held at the Albert Hall in Canberra. The car was charged overnight, taking between 7 and 10 hours. This was undertaken by a Tungar bulb charger made up in Sir Roland's own workshop from a transformer made by the Boss Electrical Manufacturing Co. and two General-Electric Tungar rectifier bulbs. Sir Roland smuggled the bulbs out of the United States of America in late 1942. The car had a top speed of 20 mph (32 kph). Low and middle speeds were obtained by diverting part of the available current through a heavy resistance unit formed from a number of cast-iron grids bolted together. Reversing was accomplished by switching the current flow in the opposite direction through the motor. 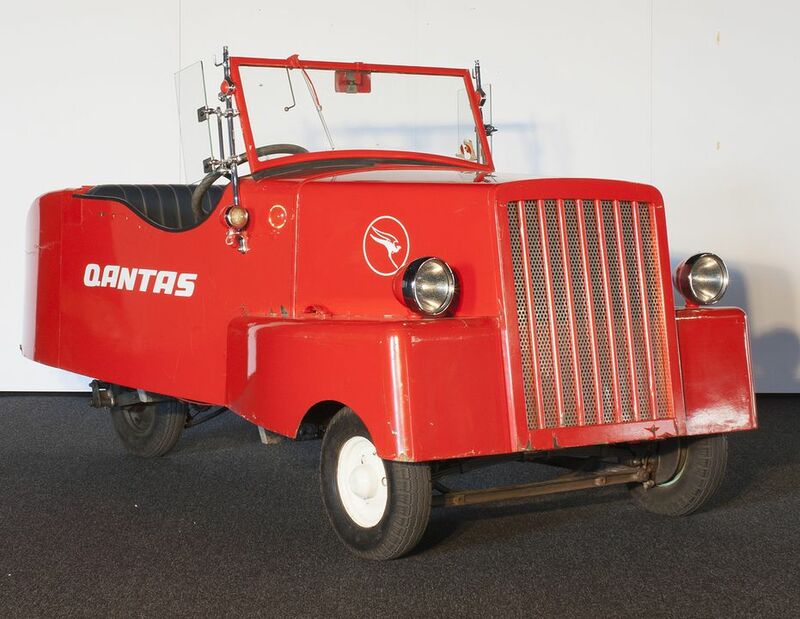 Sir Roland went on to become chairman of QANTAS until 1972, and during 1974 the car was restored by apprentices at the QANTAS Apprentice Training School at Rosebery, a Sydney suburb. A succession of apprentices worked on the car under Ross Woodcock. At this time the car was considerably improved and the paint work altered from a light blue colour to a bright QANTAS livery of red and white. Following restoration, the car was used by QANTAS marketing and operated at the Amaroo Park racing circuit at Annangrove, on the north-western outskirts of Sydney. In 1975 it was displayed at Greens Motorcade Museum, Leppington, Sydney, for about a year and then returned to the QANTAS workshop. It appears to have been then given to the School of Applied Electricity, Department of Technical and Further Education (TAFE), Sydney. Between 1976 and 1977 the TAFE staff and students made their own electric car, converted from a 1967 Hillman Imp. In contrast to the crude step voltage control used on the QANTAS vehicle, the School's car used an infinitely variable, and therefore smooth, electronic controller operated via the normal accelerator pedal by the driver. In 1978 the School of Applied Electricity donated the Roland Wilson electric car to the Museum. Two years after Sir Roland's death in 1996, the Sir Roland Wilson Foundation was established with donations from the Australian National University and the Wilson family estate to advance the study and development of public policy and management within Australia. On 26 August, 1999, Sir Roland's car was put on public display at the opening and dedication of the Sir Roland Wilson Building at The Australian National University, Canberra. The building was opened by the then Prime Minister, John Howard, and the car was a highlight of the ceremony as many old friends and associates of the late Sir Roland remembered seeing it and even riding in it.